I made this thread to share ideas and discuss plans for the design of maps and the scripting of events on those maps. Here is our map list for this release (subject to change). The first five maps all take place at night while the rest are during the day. These aren't necessarily individual maps (for example, opening scene and return scene share the same map file), but they are different "areas" if you will. The city outskirts map is the only map that I consider optional, and I listed it as a possible map to allow the player to battle enemies and complete a small side quest. 3) Add Mak Hounds to the troop movement. Currently planning on 3 hounds, but I may drop that down to 2. 7) Various other improvements in the knight movements. For example, making their walking animations out of sync so it doesn't look so odd, and showing the knights running up to the cave in their squads. Should have most of these changes done in a day or so. The animation de-syncing in #7 might be difficult to do and require some code changes. Here's an update on my progress on the opening scene. That's what the troop formation looks like. I decided to only use two hounds because three made the screen rather crowded. The numbers above the heads are the IDs of the sprites, and I have to say having this image makes scripting this scene so much easier because it's more apparent who I need to move, turn, etc. You may notice that they are organized in sets of three (1, 2, 3), (10, 11, 12), (20, 21, 22), and so on. I made some slight changes to the map tiles to make it look a little better as well. The last major thing I'm working on is getting the squads of troops to move to the cave. The "hound" squads and the squad in between them (60s) I'm not going to move because it's more difficult, and we don't necessarily need to see every person go into the cave (some can enter after the player's squad). I also managed to get rid of the stamina bar on this map as well. I'll have another major commit with the scene more-or-less finished in a short while. I expect to make a couple more tweaks to it in the future too, however. Now I want to discuss some of the plans I have for changes to the cave map. This is a lot more drastic than the changes I made to the opening scene. When the player arrives at the entrance, a short dialogue will take place and Lukar will explain that, since it's his first mission, he's letting Claudius lead the way to gain experience (hence why we see Claudius' sprite on the map). He'll briefly explain the stamina bar and how to run and dodge enemies. And he'll also explain how to access the party menu (since that is completely unapparent in the game). The stretch will go on for a short way, during which an enemy party will be encountered (forcefully, the player won't be able to run away). I think there are just too many NPCs scattered throughout the cave. I'm going to remove the less important ones and possibly replace them with dialogue between characters in the party. The purpose of this is to just make it seem a little more realistic since every knight's objective should be to get to the riverbed, not hang around and chill. Not very realistic and also rather annoying. Once an enemy dies on the map, it's death is permanent. One of the (long ignored) features was to have hidden treasures in the game, by means of a "sparkle" on the ground. (This same feature is found in Chrono Trigger). i'm going to change this scene to use this feature and explain it to the player. I'll also add an event to make sure that the player sees the corpse and does not bypass it like they could in the past. There will be some other minor touchups and improvements as well. I purposely omitted any mention of the riverbed/boss scene, but I will add what I plan to do for that later. It's going to pretty much be scrapped entirely and replaced with a much better and more complete scene. Progress on the cave map is moving along, but it will take some time for me to script all of the additional scenes and reorganize things. Once I only have the boss battle scene left, I'll commit what I've got. For now, I wanted to share the event dialogues that I have written to help guide the player through the first part of the cave. In the script below, line's with a sprite ID of 3 belong to Lukar, 2 to Mark, and 1 to Claudius. These dialogues are subject to change, but I reasonably like where they are now. I tried to really convey the personalities of Lukar and Mark through this first set of dialogue. Claudius doesn't have much to say in the first few sequences of the game, so his persona remains a little bit of a mystery. At rujasu's suggestion, I've been working on some map design drafts so that we can talk about how are maps look, what should be on them, and get into a general agreement before we fire up the map editor and start laying down tiles. We have five maps to create for this release, one of which is optional. This is a little bit of an odd map, because a large portion of it is unexplorable (the gray area). The middle area of the map is the city of Harrvah, and the player is allowed to explore the desert area just outside of the city walls (the thick black lines). They can't venture too far in the sands, and the top of the map is blocked off by the rocky hills that the castle is built atop of. We should create this map only once we are happy with the size of the Harrvah city + castle map, as essentially what we want to do is take that map, pad rows and columns of tiles on both sides and the bottom of it, and then strip out anything in the middle (no point in keeping the city tiles in there when they'll never be seen). This should be a rather easy map to create. We haven't discussed exactly what sort of side quest will happen on this map at all. As I was producing this design, I came up with a few ideas. Claudius must choose whether or not to help. If he does so, he may be late for his departure. Claudius must scour the grounds outside of the city to find the objective, then bring it back to its owner. Various small desert enemies will roam outside the walls. Maybe this map can also include an underground cave/tunnel that is used for emergencies to escape the city. During the attack, the citizen who lost their belonging was rushed through the tunnels along with many others to escape the city. The item that was dropped was dropped in this tunnel, and during the attack the entrance to the tunnel from within the city was collapsed/obstructed with rubble, and can no longer be entered from the city. Hence, the only way to get into the tunnel is from outside of the city, which is why the citizen can not retrieve this item without assistance. Desert creatures found their way into the tunnel during/after the chaos of the attack, which Claudius will have to fight his way through. If the lost item is not an object but a person, maybe when Claudius finds the person, he discovers that they are already deceased. He has to go back and tell the parent/friend/whoever of the victim of their fate, and is confronted with the grief of the other person. This could be a good character building device in the story to show how Claudius reacts to someone finding out about a lost loved one. Maybe there can be some penalty/reward system involved. If Claudius chooses to do the side quest, he may gain a small reward for completing the event, but it will cause his departure to be delayed and he will suffer consequences (or maybe just a scolding from the dock master). I'm not sure if punishing the player is an appropriate choice here, so perhaps the dialog of the sand dock is just altered slightly to reflect the fact that Claudius is late for his departure. I also had a thought that this could be a "timed mission" where if Claudius doesn't complete the mission in a certain amount of time (from the moment of accepting the quest), then there are penalties. But I think this would be more work than its worth, seeing as we don't really have any real support for "timed quests" in the game right now. Let me know your thoughts, both on the map layout draft I created above and the quest ideas. I'm particularly curious to know if anyone else likes my idea of including an underground emergency tunnel beneath the city to become a part of this map. I rather like the idea myself, because without it this map seems incredibly boring and uninteresting. Here's a draft of the sand dock map. This dock is located at the back of the castle. Its only entrance is by walking between the two mountains that the castle is built upon, thus you have to walk under the castle to reach it. In this release the map is only reachable from the city/castle map after the demon attack events are complete. It is where Claudius bids farewell to his friends and family as he sets off on his journey. The dock should be showing some stone or wooden columns that support it up in the air. Thought about surrounding the dock with walls similar to how the city is walled, but decided against it because it would just be kind of weird to have a human-sized gate for sand ships (unless we made a new kind of gate). I thought it was unnecessary to have, especially since this map is small. As always, comments/feedback are encouraged. Next I'll be sharing designs for the city/castle map, which I will do in multiple parts since this map is so large. I'll probably have one for the city and another for the castle. just letting you know that I read your updates. I just don't have anything to add since I don't know the full scope of the project and I'm just here to draw at the moment. With the editor work complete, I'm preparing to begin work on the city map soon. I'm making a few changes and adjustments to some of the tilesets that will be used (because making those changes after tiles have already been laid down will be very painful to fix. Last night I sketched out a rough outline of of what the map should look like on paper and I'm mulling it over for the next day or two. I've also created a small test map for the editor demo video and to get more familiar with building these structure types, particularly to figure out how big they should be made to allow for a modest-sized home. I may make a design layout of this map similar to the ones above, or I might just dive right in and start making the map. It will be a decent amount of work just to make that design for this complicated map, so I'm not sure if it's worth the time and effort (especially if I'm the one making it). But we'll see. I'm just focusing on building the city for now. The castle portion can easily be added later now that the editor has good resizing support implemented. Here's what the Harrvah Capital map looks like presently. It's still a work in progress and many details need to be added, but all of the primary structures of the city are complete. The album is below (decided to use imgur instead of our FTP since the images are quite large and we don't need these images long-term). There are six in total which show the majority of the map. The first two should the bottom left and right of the map, the next two the top left and right corners of the city, then an image of the mountaintops that the castle will be built on and the gate to the sanddock, and finally an image of a few of the building interiors. There are various pieces of art that I've found us to be lacking. Most of them are small (signs for weapons shop/inn/etc). Some of them are non-trivial (we need interior walls for houses so we can make rooms). 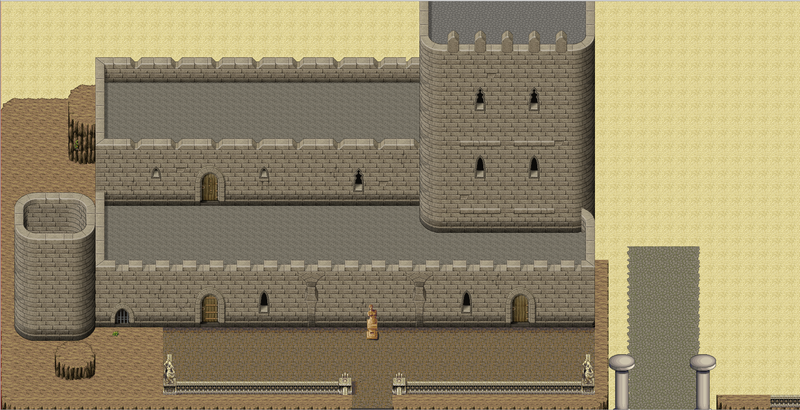 I'll be compiling a list of our art needs for this tileset in the artwork forum later. Other pieces of art need touch ups, variations, etc. One thing I don't like is the roofs of the houses. It makes no sense to have those pots up there, nor the vegetation. So I'll also be putting together a list of artwork which need some changes. None of the changes should affect the sizes/dimensions of the map though, thankfully. There's not much variation I can make to the houses other than changing their dimensions, so I tried to make them as unique as possible so it doesn't look like a cookie-cutter town. I think later having little adornments/decorations on the front walls will help this further. The grassy area is meant to be a park/public communion space. I feel like the greenery is too much, but it's all I had on hand. If we can get some more desert-ish type grass, that will replace it. The top of the map is clearly unfinished. I went as far as the cliffs that the castle sits on. The castle is what I will start on next, but I don't have a draft/design written down for it yet. The interior shows three rooms: left is the item shop, right is the inn, and top right is the weapons shop. The stairs we have I realized are not that great, and really need a lot of work to make them feel more natural in the environment. Eventualy the inn will have a basement level with many more rooms. Keep in mind this is the city in it's normal state (ie not under attack by demons, nor the aftermath of that attack). I wanted to build the full city first. After we have a city we like, we can create two more contexts that both inherit from this one, and change features here and there to show fire, debris, etc. When the player first arrives at the city, I'm going to have parts of it strategically blocked so the player has to wind their way through the city to get to the castle, encountering enemies to fight all the while. So this is a first pass of what the map is going to look like. I'm really liking how it's turning out so far and I feel I'm headed in the right direction with this. Also, the new editor has been so wonderful to use (and I'm not just saying that because I was the one who redesigned it). I did all this in about 5-6 sittings of about 30-45 minutes each. Map making is somewhat of an enjoyable process now and isn't as slow and frustrating as it used to be. Anyway, let me know what you think about these designs. If there's a serious flaw you think needs to be addressed, let me know ASAP. It will get harder to make major changes to this map as time goes on. After I got this far though, I looked back to the concept art that was created for this castle long, long ago and found it doesn't quite match up. I want to stay true to our roots (pun intended), and I wasn't quite feeling this design very much. So what I'm going to do is make it more like that concept art. I'll remove the smaller tower on the end. The side castle wall will "feed in" to the cliff face instead of being a normal stone wall. I'll remove the second floor (which felt kinda meh to me anyway). I'll make the large tower more flush with the front of the castle. And I'll remove the small double doors to enter the castle and replace it with a single double-wide door. This week I've been working on updates to the scripting of the cave map. Specifically, the events that occur on this map. I'm going to be adding new events to the beginning and end of the map, and the existing events will largely stay the same. Here's a sort of screenplay for how this map will roll out. 1) Short dialogue between Claudius, Lukar, and Mark. Lukar asks Claudius to lead the party. 2) Scripted enemy encounter (first battle). An enemy is spawned and a dialogue with party members occurs where they decide to engage it. 3) After first battle dialogue occurs where Lukar explains how enemies are spawned on the map and that players can run around them. 4) (Optional) Discovery of corpse in the cave. Short dialogue and an item is obtained. 6) Short dialogue between party members when the spring is discovered. 7) Player arrives at riverbed. Captain explains plan to unblock the waterflow, states that creatures in the area will be disturbed by the commotion and instructs knights to set a defensive parameter. 8) Party automatically moves into a position to intercept spawning enemies. Enemies are continuously spawned with short dialogues between each. Player given no chance to enter party menu to heal, etc. 9) After three "waves" of normal enemies, boss appears (Goliath Scorpion) by dropping down from the ceiling. Party engages in battle. 10) Dialogue after battle wrapping up the scene. Showing the injured knights and the now flowing river. This is the overall flow of major events without going into great detail. I'll work out the specifics as I implement each of these events. My hope is to have the scripting for this map 100% complete by the end of this month. I'll be writing the dialogue as well as I imagine Brian won't be able to get around to doing it in the next few days, but I'm hoping that he will have time to do the editing work for it later. Here are some more changes and additions I'm considering to make with the cave map. I want to replace this hound and its two handlers with a single knight that gives very brief information about accessing the character menu. I'm going to place a chest by him that contains potions, and remove any potions from the player's starting inventory. The corpse event currently gives a potion at the end of the dialogue as part of the event. Instead, I want to use the opportunity to teach the player about "glimmer" treasures. This is a feature that has long been on our list but has not yet been implemented. Essentially, a glimmer treasure is a treasure that is invisible, except for a short glimmer that is periodically seen on the screen. I want to have some sort of reward for players who explore the map (even though the map size is very limited). I'll probably add one or two treasures. Whether they are in chests or are glimmer types, I haven't decided. We don't have any lighting in effect for the cave at the moment. I want to apply a black filter to make it darker. If possible, I'd like to take advantage of our lighting system to mimic torches being carried by each NPC and the party, to illuminate things that are nearby and gradually taper off into the darkness. I'll see what's possible right now. I'm wondering if this map is too small and uninteresting for the first dungeon in the game. I'm thinking about adding a "lower level" in the cave that will be on its own map context and maybe have it be less open and more of a maze-like passage. I wouldn't be changing the current size of the map, but rather just adding a new context that serves as a new area in the map. Where this area is encountered would be in the passage where normally the player walks through a wall and emerges on the other side. I'm still very undecided on this idea. Honestly, I think it will depend on feedback from players as to whether this will be added or not. It certainly will not be added for the next development release. I don't want to dump too much information on the player right from the start. I'm going to see if this stuff can be spaced out a little more throughout the cave instead of being all up front. I'm also planning to rework the battle tutorial dialogue and leave only the core basics (for example, remove status effects from the tutorial). I only want to tell the player the minimum information that they need to know to get through the cave successfully. Everything else we want to explain can happen in Harrvah after the attack. Regarding the corpse glimmer treasure I mentioned above, I realized last night that it doesn't make sense to explain glimmer treasures here because this is an optional event that the player may pass (knowingly or unknowingly). My initial thought was to not change the even tto talk about glimmer treasures entirely and instead have that information be presented by an NPC in the capital. But I'm thinking instead of making the corpse event mandatory, and changing the bottom right section of the cave map slightly so that the player has to visit the corpse (this would lengthen the path through the cave slightly as well). For now, I'm not going to touch it because I want to wait for player feedback to see if we introduce too many concepts of the game too quickly in the cave map. After taking a couple months away to work on other things and recharge, I'm back to work on the cave map scripting. I'm being less ambitious with it this time around, and trying to just get the major events working again and the script cleaned up and organized. It can always be improved later, but for now I just want something that works. I'm removing a lot of the tutorial dialogues that I had planned for the entrance to this map. I realized that some of this is just too damn obvious "walk up to that sprite and hit the key to talk to them". I think it would be better to just pop up the help screen showing the controls for the active mode. (Valyria Tear has this feature, where you can press F1 at any time to display the help screen). That's something that can be added later. Glimmer treasures will not be done on the cave map. We don't have support for them right now, and it's not a priority for me to go about implementing them. They can be added later if we decide to include them, but they are probably better left to be introduced in the castle/town map. The "pre-boss battle gauntlet" i'm going to leave out for now. Scripting of enemy sprites proved to be a little more difficult than I thought it would be, because the enemy zones basically control these sprites, and doing custom actions for them will take a little work. I want to leave this out for a later time, but I do still think we should include it later. Roots wrote: Here's a draft of the sand dock map. This dock is located at the back of the castle. Its only entrance is by walking between the two mountains that the castle is built upon, thus you have to walk under the castle to reach it. In this release the map is only reachable from the city/castle map after the demon attack events are complete. It is where Claudius bids farewell to his friends and family as he sets off on his journey. I'm liking it so far. It's still unfinished but I think it doesn't look that bad. And thankfully I realized that we already had a dock tileset image, which I reorganized a bit before adding it to the map. I'll be making continual changes to improve this map over time, but for now I just wanted to get something in that works so that I can start scripting this final scene of the game. I might change the type of sand used below the dock to match the type of sand that is normally seen outside the town walls. Claudius' glider craft will be located to the right of the top dock just above the ladder that goes down to the sands. I was thinking about having Lukar be assigned as a guard for the sand dock (optional NPC dialogue, not a main event), and maybe hinting that he wanted to see Claudius off. But now I'm not so sure. Lukar presumably doesn't know Claudius that well, having only served with him on the recent mission and defense of the city. There is an optional sub-event I wanted to have happen between Lukar, Mark, and Claudius after the captial attack though (which I will probably add to the aftermath map). I was thinking of having them meet up and talk about Claudius' new mission, and having Mark shout at him to remember that he's still a damn rookie and storm off. Claudius turns to Lukar and asks if Mark is always abrasive as he has been, or if it's something about him that sets Mark off. Lukar reveals that Mark was close with a junior knight once who was skilled. Mark continued to encouraged and praise him, then on one dangerous mission the junior got overconfident and made a mistake that cost him his life. Mark lives with guilt thinking that he's responsible for his death, so from then on he vowed never to become close with a junior knight and to continuous remind them that they are inexperienced and need to be humbled. I think it would be nice to give a little background like that into Mark's character a bit, even though he's not a major character in the story. This would be an optional event that the player could access, not a mandatory one. I was thinking that Claudius' family could come in from off-screen just before he departs to send their farewells. But maybe they are already waiting for him at the dock? I'm not sure which one would be better (having them stand there waiting for him to leave they'd need some dialogue I imagine, but I'm not sure what would be good for them to say). Just some thoughts. I'm sure I'll find something half-way decent to do for the dock. Should have a rough draft of it finished this week and then I'll be moving on to the capital map. I did some searching around tonight for free art that we could use for the castle interior. This is the best I could find. I was imagining the castle to be more medieval than this (dark stone halls, not a lot of furnishings). But this is certainly good enough for now, and can always be improved later. This weekend I'm going to be taking these images and building tilesets to prepare them for real use. Part of me is pondering using the existing Harrvah interior for the castle and using these tiles for the house interior instead because the house interior tileset is so much richer and "feels" right. 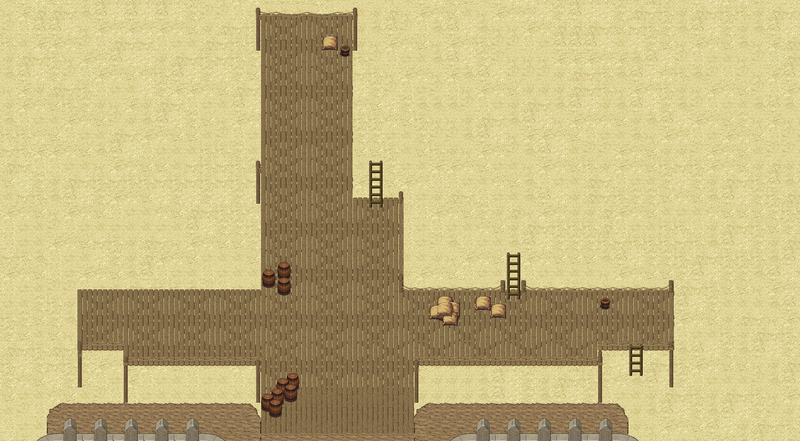 I'm going to experiment in the map editor to see if this is a good idea and if so, I'll use the tilesets in this way. I also need to pull together some tiles for representing destruction/fire/debris for the castle map as well. I expect that I'll be having to create some art of my own to help fill in some gaps, but for the most part I think we have the minimum of what we need for now. I'm going to do only a minor further amount of work on the dock map because it's a great map script for someone else to work on since it's very small and basic. And I would really like to have someone other than myself with the knowledge and capability to do map scripting. Any chance of getting a full shot of the Cave system? Haven't taken a good solid look at downloading and using the editor yet, but I'd love to see the overall structure we're working with. Not easily, I'm afraid. We have no way to "zoom out" of a map in the editor or otherwise so you pretty much have to maximize the editor window and take a number of screenshots to get a full picture. Also I'm not sure what system you're working on, but the editor has only been compiled/used recently on Linux. To get it working on Windows or OS X will take some work. I might be able to help with building it on Windows, but OS X I have no ability to do anything about. (I'm a Linux developer). I do have some shots of the Harrvah city, castle, and sand dock. These are still a work in progress and 90+% of our mapping work for the next release will be with these maps. The cave map is plenty good enough for now.